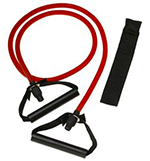 The exercise band is used in resistance training. The bands comes in a variety of colours depending on the amount of tension they offer. The exercise bands give constant resistance throughout the entire range of motion during an exercise and cause less stress on the joints. Stand on the band and start with your feet shoulder width apart. Hold the band at your side, the more slack you ;ull, the more tension you'll get out of the band. Take a lateral step to the side keeping your knees soft and your feet pointing straight forward. After taking several steps, repeat in the opposite direction. Learn 10 exercises the use the exercise band.